Staind (/steɪnd/ STAYND) is an American rock band formed in 1995. 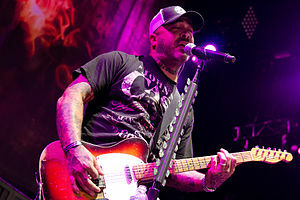 The original lineup consisted of lead vocalist and rhythm guitarist Aaron Lewis, lead guitarist Mike Mushok, bassist and backing vocalist Johnny April, and drummer Jon Wysocki. The lineup has been stable outside of the 2011 departure of Wysocki, who was replaced by Sal Giancarelli. Staind has recorded seven studio albums: Tormented (1996), Dysfunction (1999), Break the Cycle (2001), 14 Shades of Grey (2003), Chapter V (2005), The Illusion of Progress (2008), and Staind (2011). The band's activity became more sporadic after their self-titled release, with Lewis pursuing a solo country music career and Mushok subsequently joining the band Saint Asonia, but they have continued to tour on and off in the following years. As of 2016, Lewis has reiterated that the band has not broken up, and will possibly create another album, but that his current focus is on his solo career. Staind most recently performed live in 2017, and as of 2018, they are on hiatus. The band has sold over 15 million records worldwide. Many of their singles have reached high positions on US rock and all-format charts as well, including "It's Been Awhile", "Fade", "Price to Play", "So Far Away", and "Right Here". In 1993, vocalist Aaron Lewis and guitarist Mike Mushok met at a Christmas party in Springfield, Massachusetts. Mushok introduced drummer Jon Wysocki while Lewis brought in bassist Johnny April to form the band in 1995. Their first public performance was in February 1995, playing a heavy, dark, and introspective style of metal. Extensive touring in the Northeast helped Staind acquire a regional following over the next few years. The band started covering Korn, Rage Against the Machine, Pearl Jam, Tool, and Alice in Chains, among others, and played at local clubs (most commonly playing at Club Infinity) for a year and a half. Staind self-released their debut album, Tormented, in November 1996, citing Tool, Faith No More, and Pantera as their influences. In October 1997, Staind acquired a concert slot through Aaron's cousin Justin Cantor with Limp Bizkit. Just prior to the performance, Limp Bizkit frontman Fred Durst was appalled by Staind's grotesque album cover and unsuccessfully attempted to remove them from the bill. Durst thought that Staind were Theistic Satanists. After being persuaded to let them perform, however, Durst was so impressed that he signed them to Flip Records by February 1998. On April 13, 1999, Staind released their major label debut Dysfunction on Flip Records. The album, which was co-produced by Fred Durst and Terry Date (who also produced acts like Soundgarden, Deftones, and Pantera), received comparisons to alternative metal giants Tool and Korn. In particular, Aaron Lewis was lauded for his vocals, which were likened to those of Pearl Jam's Eddie Vedder. The album achieved slow success, reaching the No. 1 spot on Billboard's Heatseeker Charts almost six months after its debut. In the same week, the record jumped to No. 74 on Billboard's Top 200 Album Charts. The nine-track LP (with one hidden track, "Excess Baggage") produced three singles, "Just Go", "Mudshovel", and "Home". "Mudshovel" and "Home" both received radio play, cracking the Top 20 of Billboard's Modern Rock and Mainstream Rock charts. In promotion of Dysfunction, Staind went on several tours, including the Family Values Tour with acts like Limp Bizkit and The Crystal Method, as well as opening for Sevendust's headlining tour. Staind toured with Limp Bizkit for the Family Values Tour during the fall of 1999, where Aaron Lewis performed an early version of "Outside" with Fred Durst at the Mississippi Coast Coliseum. Staind released their third studio album, Break the Cycle, on May 22, 2001. Propelled by the success of the first single, "It's Been Awhile", the album debuted at No. 1 on Billboard's Top 200 Album charts, selling 716,000 copies in its first week. The record's first-week sales were the second highest of any album that year, behind Creed's Weathered. Break the Cycle saw the band retaining the nu metal sound from their previous album. Despite this, the album saw the band going further into a post-grunge sound which is evident in the smash hit song "It's Been Awhile", and the song led critics to compare the band to several other post-grunge bands at the time. The record spawned the singles "It's Been Awhile" (which hit the Billboard Top 10), "Fade", "Outside", "For You", and the acoustic ballad "Epiphany". "It's Been Awhile" spent a total of 16 and 14 weeks on top of the modern and mainstream rock charts respectively, making it one of the highest joint numbers of all time. In 2001, Break the Cycle sold four million copies worldwide, making it one of the best selling albums that year. Break the Cycle would go on to sell seven million copies worldwide, making this Staind's bestselling album. In early 2003, Staind embarked on a worldwide tour to promote the release of the follow-up to Break the Cycle, 14 Shades of Grey, which sold two million copies and debuted at number 1 on the Billboard 200. The album saw a departure from their previous nu metal sound as it mostly contained a lighter and more melodic post-grunge sound. 14 Shades of Grey produced two mainstream hits, "Price to Play" and "So Far Away", which spent 14 weeks on top of the rock chart. In addition, two other singles were released: "How About You" and "Zoe Jane". The band's appearance at the Reading Festival during their 2003 tour had another impromptu acoustic set, this time due to equipment failure. The singles "So Far Away" and "Price to Play" came with two unreleased tracks, "Novocaine" and "Let It Out", which were released for the special edition of the group's subsequent album Chapter V, which came out in late 2005. In 2003, Staind unsuccessfully sued their logo designer Jon Stainbrook in New York Federal Court for attempting to re-use the logo he had sold to the band. They re-opened the case in mid-2005. Staind's fifth album, titled Chapter V, was released on August 9, 2005, and became their third consecutive number one. The album opened to sales of 185,000 and has since been certified platinum in the U.S. The first single, "Right Here", was the biggest success from the album, garnering much mainstream radio play and peaking at number 1 on the mainstream rock chart. "Falling" was released as the second single, followed by "Everything Changes" and "King of All Excuses". Staind went on the road when the album came out, doing live shows and promoting it for a full year, including participating in the Fall Brawl tour with P.O.D., Taproot, and Flyleaf; they also had a solo tour across Europe and a mini-promotional tour in Australia for the first time. Other live shows included a cover of Pantera's "This Love", a tribute to Dimebag Darrell. Staind appeared on The Howard Stern Show on August 10, 2005 to promote Chapter V. They performed acoustic renditions of the single "Right Here" and Beetlejuice's song "This is Beetle". In early November 2005, Staind released the limited edition 2-CD/DVD set of Chapter V. On September 6, 2006, they performed an acoustic show in the Hiro Ballroom, New York City, that was recorded for their singles collection. The band played sixteen songs, including three covers: Tool's "Sober", Pink Floyd's "Comfortably Numb", and Alice in Chains's "Nutshell". The collection The Singles: 1996–2006 was released on November 14, 2006. It included all the band's singles, the three covers performed at the New York show, and a remastered version of "Come Again" from Staind's first independent release Tormented. On August 19, 2008, Staind released their sixth album, The Illusion of Progress. Prior to the album's release, the track "This Is It" was available for download on the iTunes Store, as well as for Rock Band. The album debuted at No. 3 on the US Billboard 200, No. 1 on the Top Modern Rock/Alternative Albums Chart, No. 1 on the Top Digital Albums Chart, and also No. 1 on the Top Internet Albums Chart, with first-week sales of 91,800 units. The first single on the album, "Believe", topped Billboard's Top 10 Modern Rock Tracks on September 5, 2008. The band also supported Nickelback on their 2008 European tour. The second single was "All I Want", and came out on November 24. The single also became Staind's 13th top 20 hit on the rock charts. In Europe, the second single was "The Way I Am", released on January 26, 2009. The final single released from the album, "This Is It", was sent to radio stations across the country on May 4, 2009. The track was also included on the successful Transformers: Revenge of the Fallen – The Album released in late June 2009. The same year, Staind embarked on a fall tour with the newly reunited Creed. In March 2010, Aaron Lewis stated the band would start working on their seventh studio album by the end of the year. Lewis had finished recording his country music solo EP and had started a nonprofit organization to reopen his daughter's elementary school in Worthington, Massachusetts. Guitarist Mike Mushok stated in a Q&A session with fans that the band was looking to make a heavy record, but still "explore some of the things we did on the last record and take them somewhere new for us". In a webisode posted on the band's website, Lewis stated that eight songs were written and that "every one of them is as heavy or heavier than the heaviest song on the last record". In December 2010, Staind posted three webisodes from the studio, which featured the band members discussing the writing and recording process of their new album. They announced that as of April 20, they had completed the recording of their untitled seventh album and would release it later that year. On May 20, 2011, Staind announced that original drummer Jon Wysocki had left the band. Drummer Will Hunt filled in for a few dates, while Wysocki's drum tech Sal Giancarelli filled in for the rest of the tour. Three days later, it was reported that Staind's new album was originally called Seven, but was renamed Staind. It was released on September 13, 2011. The first single, "Not Again", was released to active radio stations on July 18. The song "The Bottom" appeared on the Transformers: Dark of the Moon soundtrack. On June 30, Staind released a song called "Eyes Wide Open" from their new record. "Eyes Wide Open" would later be released on November 29 as the album's second single. In November 2011, the band announced through their YouTube page that Sal Giancarelli was now an official member. The band continued to perform into 2012, embarking on an April and May tour with Godsmack and Halestorm, and they played the Uproar Festival in August and September with Shinedown and a number of other artists. It was announced in July 2012 that the band was to be taking a hiatus. In an interview with Billboard, Aaron Lewis stated that "We're not breaking up. We're not gonna stop making music. We're just going to take a little hiatus that really hasn't ever been taken in our career. We put out seven records in 14 years. We've been pretty busy." Lewis also had plans to release his first solo album The Road. During this time, Mike Mushok auditioned, and was selected, to play guitar for former Metallica bassist Jason Newsted's new band Newsted. He featured on their debut album Heavy Metal Music. Staind played their first show in two years at the Welcome To Rockville Festival on April 27, 2014. They also played the Carolina Rebellion and Rock on the Range festivals in May 2014. In late 2014, the band went on another hiatus. Aaron Lewis continued to play solo shows and work on his next solo album. He also confirmed that the hiatus would last "for a while". Mike Mushok teamed up with former Three Days Grace singer Adam Gontier, former Finger Eleven drummer Rich Beddoe, and Eye Empire bassist Corey Lowery to form Saint Asonia. When asked in an August 2016 interview about Staind's future, Mushok stated that the hiatus could possibly be the end of the band. He explained, "I remember '09, we stopped touring, and we did a record after that. We did the self-titled Staind record, which we did a little touring on. It was one of my favorite Staind records we had done. Aaron, I know, has another country record coming out in September. So...you know, we say we're gonna do something else, but there's no real plan for it right now. I know he's pursuing. And I know we're writing another record." In addition, Aaron Lewis indicated that he is focused on country music while noting "Do I think there's room somewhere down the road for Staind to play shows in the summertime, radio festivals and stuff like that? Sure. Do I think I have another one of those Staind records in me? Of course I do. All I have to do is live." The touring machine, as you call it, of Staind will never be again. Not like that, no. Never. I could never go back to playing six shows [a week] eight weeks in a row. I can’t do that. I have grown in my age and become very accustomed to playing Thursday, Friday and Saturday and being able to go home for a few days and unwind and try to kind of have a life aside from doing this. In April 2019, the band announced they would reform in September 2019 for some live performances. The topics of Staind's lyrics cover issues of depression, relationships, death, addiction, finding one's self, betrayal, and even Lewis' thoughts about becoming a father in the song "Zoe Jane" from 14 Shades of Grey, as well as reflecting on his upbringing in the song "The Corner" from The Illusion of Progress. Also from 14 Shades of Grey, the track titled "Layne" was written about Alice in Chains frontman Layne Staley in response to his death in 2002. The song is also about Staley's legacy and the effect his music had on the members of Staind, especially Aaron Lewis. Staind has been categorized as nu metal, alternative metal, heavy metal, hard rock, and post-grunge. Staind got their first break in 1998 when [Fred] Durst signed the band to his Flip Records. That association has linked the group with "new metal," though Break the Cycle's sound is neither particularly new nor metal. The band doesn't rap, and though Mushok has adopted new-metal's minor-key guitar riffs, Lewis' dramatic voice and the anthemic quality of such songs as "Open Your Eyes" and "Fade" are more akin to Alice in Chains than to Korn. Aggressive yet reflective, Break the Cycle doesn't require a poisonous abundance of testosterone to be appreciated and is better suited to solitary listening than to the mosh pit. Staind's influences include Slayer, Sepultura, The Doors, Pantera, Kiss, Van Halen, Led Zeppelin, Whitesnake, the Beatles, Alice in Chains, Black Sabbath, Pearl Jam, Tool, Nirvana, Stone Temple Pilots, Helmet, James Taylor, Korn, and Crosby, Stills & Nash. ^ "Staind – Roadrunner Records UK". Roadrunnerrecords.co.uk. 2011-09-19. Retrieved 2011-10-31. ^ Berelian, Essi (2005). The Rough Guide to Heavy Metal. Rough Guides. p. 343. ISBN 9781843534150. ^ Tognazzini, Anthony. "Tormented - Staind | Review". AllMusic. Retrieved 2017-01-20. ^ a b "Inside the Outside with Stainds Aaron Lewis: Devil not included". Michigan Daily. April 9, 2001. Retrieved September 8, 2015. ^ a b True, Chris. "Staind | Biography & History". AllMusic. Rovi Corporation. Retrieved September 8, 2015. ^ Grierson, Tim. "Staind – Career Biography and Discography". About.com. Retrieved September 8, 2015. ^ Hall, Chris (November 2, 2001). "Artist of the Week" (PDF). The Southeastern. 82 (10). p. 5. Retrieved March 19, 2017. ^ Harris, Ron (July 26, 1999). "Sound Bites: audio reviews". Associated Press (archive). Retrieved January 19, 2013. Lead singer Aaron Lewis' vocals fuel the fire well. If Pearl Jam's Eddie Vedder hadn't perfected the outcast rock warble first, Lewis would have done it anyway. There's no stopping Staind's determination behind the furious drumming of Jon Wysocki and adventurous guitar work from Mike Mushok. ^ a b Hay, Carla (October 23, 1999). Flip's Staind Stands Tall As Proof Of Rock's Resurgence. Billboard. Retrieved January 19, 2013. ^ Limp Bizkit Talks "Real" Lineup As Family Values Tour Kicks Off MTV News. September 21, 1999. ^ Sevendust Taps Powerman 5000, Staind, Skunk Anansie For U.S. Tour MTV News. July 27, 1999. ^ Staind Score Third Straight Billboard Win With Chapter V MTV News. August 17, 2005. ^ Pop Albums; A Prolonged Spin 'Cycle' for Staind LA Times. June 7, 2001. ^ "University: Post-Grunge 101". Rhapsody. 2014-09-01. Retrieved 2015-08-11. ^ a b "Staind - Chart history (Billboard Hot 100)". www.billboard.com. Retrieved 2017-01-20. ^ a b "Staind - Chart history (Billboard 200 albums)". www.billboard.com. Retrieved 2017-01-20. ^ Erlewine, Stephen Thomas. "14 Shades of Grey - Staind | Review". AllMusic. Retrieved 2017-01-20. ^ "Ohio Musician Files Countersuit Against STAIND For Trademark Infringement". Blabbermouth.net. March 19, 2005. Archived from the original on 2005-03-20. ^ "Staind: 'The Singles: 1996-2006' CD, 'Staind: The Videos' DVD details revealed". Blabbermouth.net. 2006-10-18. Archived from the original on 2007-03-26. Retrieved 2006-10-18. ^ "Transformers: Revenge of the Fallen - Original Soundtrack". AllMusic. Retrieved 2017-01-20. ^ "Aaron Lewis: 'I've Never Tried To Be Master Of Anything' | Interviews @". Ultimate-guitar.com. 2008-08-23. Archived from the original on 2011-06-05. Retrieved 2011-10-31. ^ "Staind's Aaron Lewis Starts New Charity, Discusses Solo Debut". Billboard.com. 2009-09-14. Retrieved 2011-10-31. ^ "Mike Mushok Q + A, part I – STAIND". Staind.com. 2010-10-22. Retrieved 2011-10-31. ^ "Staind in the Studio – Webisode # 3 – Staind". Staind.com. 2010-12-23. Retrieved 2011-10-31. ^ "Staind Complete Recording Of New Album". Rockaccess.net. 2011-04-21. Archived from the original on 2011-08-26. Retrieved 2011-10-31. ^ "Staind has parted ways with drummer Jon Wysocki". Staind.com. 2011-05-20. Retrieved 2011-10-31. ^ "Staind: New Album Title Revealed". Roadrunnerrecords.com. Archived from the original on 2011-08-21. Retrieved 2011-10-31. ^ "Staind To Release 'Seven' In September :: Rock Access – Rock News". Rockaccess.net. 2011-06-12. Archived from the original on 2011-08-07. Retrieved 2011-10-31. ^ "'Transformers: Dark Of The Moon' Track List Announced :: Rock Access – Rock News". Rockaccess.net. 2011-05-25. Archived from the original on 2011-12-02. Retrieved 2011-10-31. ^ a b Kaufman, Spencer. "Godsmack, Staind and Halestorm Announce Dates for 2012 U.S. Tour". Loudwire. ^ Graff, Gary. "Aaron Lewis on Staind's Upcoming Hiatus: 'We're Not Breaking Up'". Billboard.com. Billboard. Retrieved 25 January 2014. ^ Childers, Chad. "Staind Taking Hiatus, But Aaron Lewis States: 'We're Not Breaking Up' Read More: Staind Taking Hiatus, But Aaron Lewis States: 'We're Not Breaking Up'". Loudwire.com. Loudwire. Retrieved 25 January 2014. ^ "STAIND Guitarist Joins NEWSTED". Blabbermouth. Retrieved March 19, 2013. ^ "Welcome to Rockville 2014: Avenged Sevenfold, Korn + More". Loudwire. Retrieved 2017-01-20. ^ "Guns N' Roses, Avenged Sevenfold, Slayer, Motörhead Confirmed For Rock On The Range". Blabbermouth.net and. 2014-01-16. Retrieved 2014-01-16. ^ "Mike Mushok: There Is 'No Real Plan' For Staind Recording Or Touring Again". Blabbermouth.net. 22 August 2016. Retrieved 22 August 2016. ^ "Aaron Lewis on Staind's Status: 'We Haven't Broken Up'". Loudwire.com. 28 September 2016. Retrieved 28 September 2016. ^ "Staind Reunion and Tributes to Chris Cornell + Chester Bennington Highlight Aaron Lewis' Charity Show". Loudwire.com. 4 August 2017. Retrieved 4 August 2017. ^ Udo, Tommy (2002). Brave Nu World. Sanctuary Publishing. pp. 82–96, 241–242. ISBN 1-86074-415-X. ^ "Ventura County Reporter - Simple kind of man". Vcreporter.com. February 21, 2013. Archived from the original on February 2, 2014. ^ "Artists :: STAIND". MusicMight. Archived from the original on 2016-03-03. ^ Grierson, Tim. "Top 10 Essential Rock Songs". About.com. ^ Billboard (2003-05-19). "Staind Sets Spring/Summer Shows". Billboard. Retrieved 2019-02-28. ^ "MULTI-PLATINUM HARD ROCKERS STAIND RETURN TO TROPICANA NOVEMBER 8". Tropicana. September 2, 2014. Retrieved September 8, 2015. ^ "Aaron Lewis trades hard rock of Staind for solo country gig". Centre Daily Times. September 26, 2014. Retrieved September 8, 2015. ^ Hudak, Joseph; Hudak, Joseph (27 September 2016). "Aaron Lewis on Controversy, Being 'Too Country' and Future of Staind". ^ Eliscu, Jenny; Eliscu, Jenny (19 July 2001). "Staind: Dark Stars". ^ "Korn, Slayer, Staind, Five Finger Death Punch Members Talk Pantera". Blabbermouth.net. December 5, 2012. ^ Amendola, Billy. "Web Exclusive Interview: Jon Wysocki of Staind". Modern Drummer. ^ Young, Kevin (September 12, 2008). "Interview: Aaron Lewis". AskMen. Archived from the original on 2017-08-30. Retrieved 2018-12-05. ^ Florino, Rick (July 27, 2011). "A Conversation Between Aaron Lewis of Staind and Corey Taylor of Stone Sour and Slipknot about "It Takes A Community"". ARTISTdirect. ^ MacIntosh, Dan (December 29, 2011). "Aaron Lewis : Songwriter Interviews". Songfacts. Retrieved March 20, 2019.